WARNING: This is not just your average hotdog! 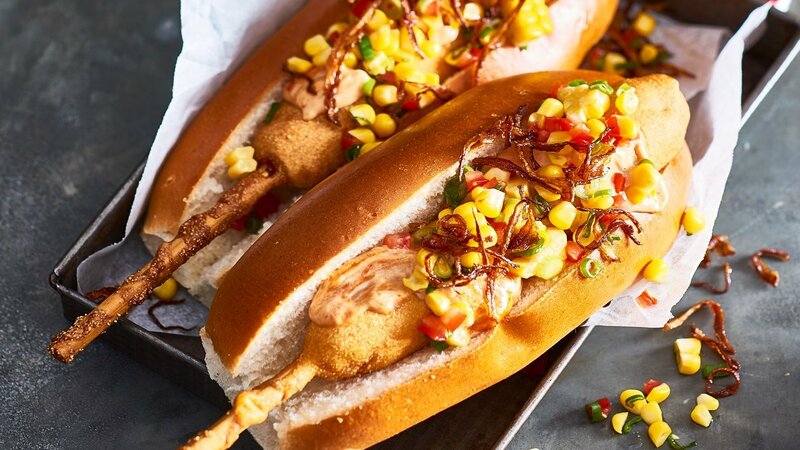 The Chipotle Corn-dawgs are dipped in cornmeal batter for an extra crispy finish and topped with fresh salsa and crispy onions. Two iconic American foods smashed into one explosive food experience. Check out the recipe below! Combine the batter ingredients together with 1/2 of the Aromat Seasoning Powder. Place bamboo sticks into sausages, lightly dust with flour and dip into batter. Deep fry until cooked and golden. Boil corn and remove the kernels from the cob with a sharp knife. Combine with the green onion, tomato, oil, Knorr lime seasoning powder and remaining Knorr Aromat Seasoning Powder. Refrigerate for use. Fry onions in deep fryer at 160C until golden and crispy. Combine the Hellmann’s Classic Mayonnaise and Chipotle BBQ Sauce together and refrigerate for use. Place cook dawgs into warmed hotdog rolls and add salsa, chipotle mayo and finally top with tobacco onions.